It’s no secret that I am a big Burgundy fan. 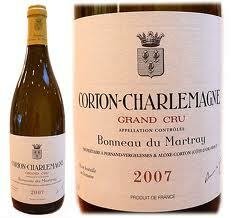 And within that region, one of the biggest and most famous Grand Crus is Corton Charlemagne. Terry was lucky enough to recently attend a tasting of wines from an esteemedth estate. 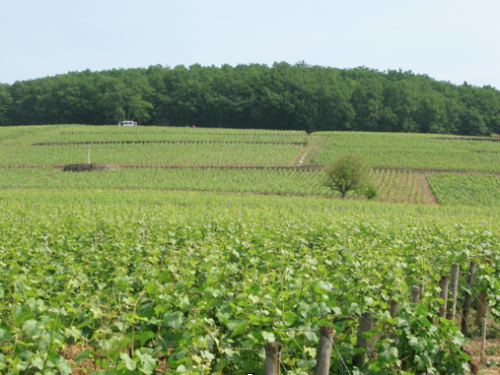 Corton is the largest area of Grands Crus in Burgundy. This terroir also called la montagne (the mountain) in the Aloxe-Corton area produces the best red wines of Côte de Beaune. Corton needs to age at least 10 years to develop the smooth, rich red fruits aroma. 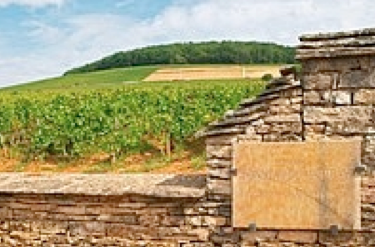 At the top of the hill, Corton-Charlemagne is a great white Burgundy wine, one of the best in the region among Montrachet and Meursault. It is said that the french emperor Charlemagne owned this place 1,300 years ago. 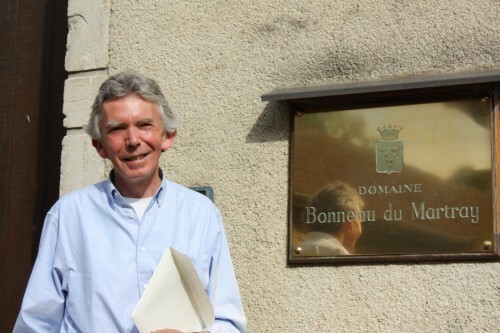 The elegance of Jean-Charles Le Bault de la Moriniere, owner of the Domaine Bonneau Du Martray Corton Charlemagne was ever so present during our evening tasting through a collection of his vintages during dinner. Jean Charles inherited the estate from his father in 1994 and has been working on the total biodynamic regiment for the vines and soil, moving away from any herbicides or pesticides. He is also working diligently to reduce the quantity of the grape yields and in return producing a higher quality wine. 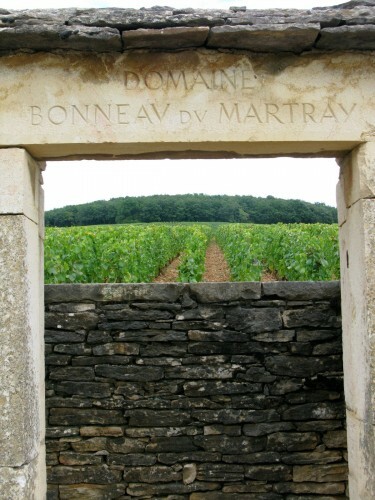 Bonneau du Martray is the largest single owner of vines with the Corton Charlemagne vineyard and owns the largest area of a single Grand Cru vineyard of any producer in Burgundy. Looking into the vineyards of Corton Charlemagne from the burgundy trail. The Estate produces two wines from their vineyard holdings at the Domaine. 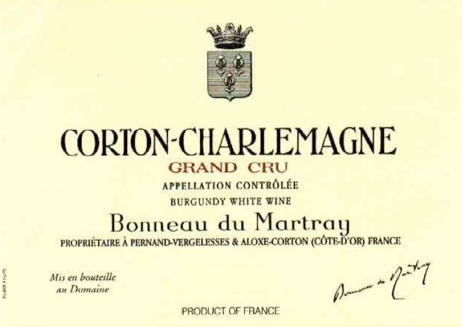 A Corton Charlemagne (white burgundy) 100% Chardonnay grapes and a very small portion of Corton Charlemagne (red burgundy) which is 100% Pinot Noir grapes. Their classic label for the white is below. During the evening at our dinner at North Restaurant in Armonk, NY, we tasted through the 2001, 2005, 2007, 2008, and 2009 all of which had significant flavors. We started with the younger 2009 that was round, young and just starting to show. 2009 was a star of a year for ripeness and acid balance. The 2008 was bit richer which stems from the fact that the 2008 climate was much hotter and a bit more difficult. The quantities were smaller than 2009. All the producers had to sort their grapes after harvest very carefully. While I was visiting Burgundy during the harvest of 2008 I saw vines that had – all on one cluster – grapes ripe, unripe as well as grapes that had started to rot. that the north wind saved the harvest. There was an abundance of rain near the end of the growing season and the north wind came along and dried out the leaves so there was little to no mildew. The Corton Charlemagne 2007 was full of Chardonnay flavors in the nose and on the palate with the lovely hint of good acidity on the finish. The 2005 had more of an earthy finish and a stupendous nose. 2005 was also a heralded year as was 2009. The 2001 was a little more golden in color, still showing well with notes of butterscotch flavors through the finish as you can find in a white burgundy that is 10 years old. Thanks Terry – a classic white burgundy that I would be thrilled to serve for a special occasion. And Terry reminds me if you are thinking of visiting Restaurant North, be sure to make reservations, for this popular spot is always packed! This entry posted in food and drink, travel, wine. 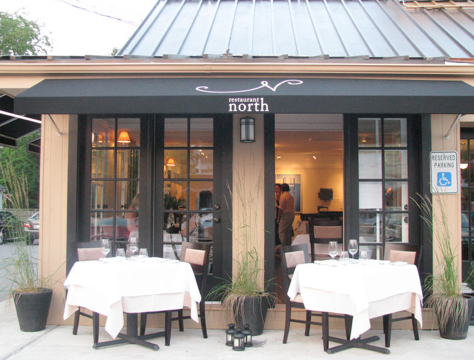 Entry Tags: Jean-Charles Le Bault de la Moriniere, North Restaurant in Armonk, White Burgundy Wine Bookmark the permalink. I’ve always wanted to take a wine tour but never been able to do it… lovely! There’s enough lovely whine in this post to rival an excerpt from Tonjours Provence! I too love a nice Burgundy. Lucky you to try the variety through a few years. Happy Wednesday! and all those wine tastings. Thanks for sharing those pics and info. I really like a good burgundy wine. Thanks for sharing, q! How lovely. A crisp white Burgundy sounds perfect for a warm summer evening. Perhaps I should chill some for dinner and have my own Wine Wednesday celebration today! Hope your Wine Wednesday is delicious! What a beautiful region. While I rarely drink reds, when I do I love a wonderful burgundy. Sounds like a great tasting! I’m laying it bed catching up on blogs (had surgery yesterday) and I’m dying for a glass of vino LOL. I’m just started to tackle the french and have been experimenting. I just had a lovely burgundy the other day and look forward to trying more. Great post Q! One of these days I would love to do a California wine tours vacation! Hello Stacie ~ SM here again. We just held our drawing and you won! I can’t wait to send off your prizes! Thank you for all of your visits to the market, we love your comments. Please send me your addresss so I can mail off to you! Yay!! Thank you Emily – will send you an email now!! What fun!! Wonderful Wednesday post, as always. Love burgundy wine and this sounds like a great one!! 82 queries in 0.520 seconds.